Ross has been at the forefront of the motor car since their conception. It has had numerous car show rooms, motor mechanics and motor vehicle manufacturers since the late 1800s right up to the present day. 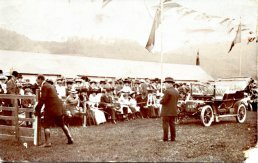 This is the photo of the supposed "first car" in Ross as shown on On The Camp Ground, Ross. This car is clearly a novelty to the people of Ross as it appears to be the centre of attraction at this event. The car has a registration plate AD78 (or maybe 6 or 3). Apparently, from the very start in 1903 counties were issued with letters because they were required to issue the registrations. It didn't happen quite as smoothly as A1 - ZZ999. Single non-county letters were being issued side by side with county "double" letters, and, it seems Herefordshire got AD. Therefore AD7x could well be as early as 1903 or 1904. Ross had two Motor Car manufacturers that started at around this time called Cassons and Butchers. Cassons were on Henry Street in the shop that is now Wye Electrics Shop and Butchers were on Brookend Street opposite where the Gardner Butcher "Motor House" (garage) is today until he built the "Motor House" on the opposite side. Mr. Butcher then needed more room so he created a manufacturing workshop on Cantilupe Road opposite Cassons in the shop that is now Ross Hydroponics and Clarke Roxburgh Insurance Brokers. The competition was great and eventually they joined forces, due to different areas of expertise, to become Butcher & Casson Ltd. They produced a wide range of hand-built motor vehicles, from cars to various vans to small lorries all built to order by a ten man team. Also at this time repair garages where popping up around the town. Ernest Passey and Son started a repair garage in around 1900 which was called the Ryefield Garage so presumably it was somewhere towards Ryefield Road or that area. This was one of Ross' first Motor Garages and references continue until around 1938. By 1914, Mr. Passey had joined forces with Mr. Hall and opened the Central Garage on Gloucester Road. This was next to the Post Office, now The Mailrooms Pub, which was a very prominent position. The Garage was a motor engineers and car body builders and this later became a motor & cycle engineers (the cycle engineers may have been there prior to the garage). Many thanks to Nigel Edwards for the supply of the photo and details on the first car.